IN PLACE OF THE THINK-FREE fare that often populates theater's off-season, TheatreWorks offers Lanford Wilson's Talley's Folly, a warm summer romance firmly rooted in reality. Set in WWII Missouri, this compact but rich one-act play (a mere 97 minutes, we're told in the opening monologue) explores the would-be romance between a gentle Jewish accountant, Matt Friedman (Jackson Davis), and a stubborn Southern belle no longer in the bloom of her youth, Sally Talley (Julie Eccles). Sensitive direction by Robert Kelley and powerful performances by Davis and Eccles bring out the layers of subtlety in characters who leave more unsaid than it first appears. Religion, the obvious obstacle to their relationship, is raised right from the start, but there's a strong impression that although it's a major issue for the Talley family, Sally and Matt regard their religious differences as the most superficial of their problems. The two both harbor secrets in their jealously guarded prior lives. The revelation of their respective pasts, and Sally and Matt's terror that the other might reject him or her for these secrets, is the foundation of the play. Among its many themes, the play explores the various ways we try to define the value of a human being--an idea that has particularly troubling resonance when set against the WWII era. Matt's family was persecuted in Europe; Sally is haunted by a wounding personal experience that had economic repercussions for her family. Of course, the play doesn't strive to offer a definition of human value, instead demonstrating there's no point in trying to appraise what is inevitably invaluable--and that humans are strongest when we would seem to be at our most vulnerable, when we open our hearts and minds to each other. 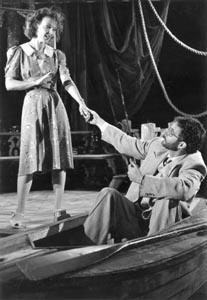 The play takes place in an abandoned boathouse built by one of Sally's relatives; it is the "folly" from which the play ostensibly takes its name. The gaudy Victorian boathouse is crumbling into ruins, a symbol of the idea of wasted beauty that has become so integral to Sally's life. Draped with moss and honeysuckle and dappled with Steven B. Mannshardt's skillful lighting, Andrea Bechert's set is gorgeous--so painstakingly detailed you can practically feel the humidity. The set integrates well into the space of the cozy, black-box SecondStage theater, making this already intimate play even more invitingly so.